I use GoDaddy as my hosting and obviously have a WordPress install. 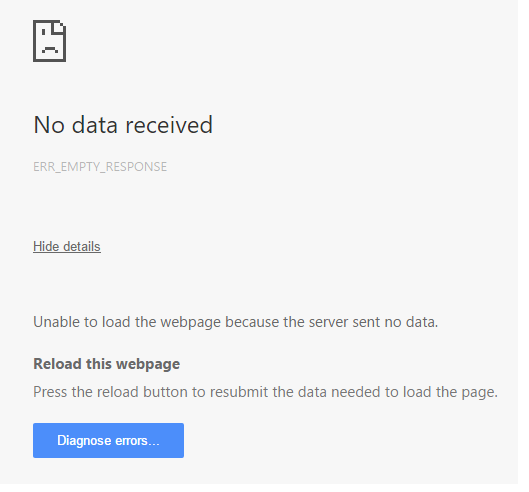 A few months ago, I started running into this error on Google Chrome: “No data received [ERR_EMPTY_RESPONSE] Unable to load the webpage because the server sent no data.” I got a similar message in Firefox: “The connection to the server was reset while the page was loading.” This happened whenever I tried to make a new post and really put a damper on my blog activities on my various blogs. I searched numerous forums, checked out my GoDaddy CPanel, looked at my FTP files, uninstalled & deactivated plugins, and made sure WordPress & plugins were all up to date. Still nothing worked! I did discover that the error could be triggered when editing files, as well though. Becoming frustrated, I checked line-by-line of a draft to see what triggered the error, and I discovered it. The error occurred anytime a post had links with “http:” & “https:”. Obviously removing the protocol declaration from links (and images) in a blog post could be problematic if I needed to link externally but thankfully, you don’t need to declare a protocol to make links. You can instead point to a website like this: //www.google.com instead of http:||google.com (slashes would be here instead of pipes obviously). With any post I now make, I just make sure my links use protocol-relative URLs instead of declaring the protocol and I no longer receive errors. Unfortunately, I have yet to discover the root cause of the problem, but for the time being, it allows me to blog again while I figure it out.